Audacity Jones and her best friend, Bimmy, are setting off from Miss Maisie's School for Wayward Girls on an extraordinary adventure! In the glittering city of New York, the girls meet Harry Houdini, the world's most famous magician, as he prepares a new spectacle: Houdini plans to make an elephant disappear from a crowded theater. But Audacity and Bimmy discover a nefarious plot that puts Houdini's illusion in jeopardy. Who could be trying to sabotage the master magician? 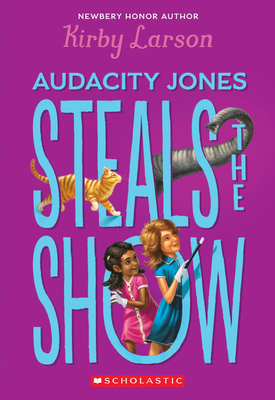 Audie will need all her smarts, the help of friends new and old, and even her best juggling skills to solve this mystery. Will she manage to save the show in time? Kirby Larson is the acclaimed author of the 2007 Newbery Honor Book Hattie Big Sky; its sequel, Hattie Ever After; The Friendship Doll; Dear America: The Fences Between Us; Duke; Dash, winner of the Scott O'Dell Award for Historical Fiction; Liberty; Bear; Audacity Jones to the Rescue; and its sequel, Audacity Jones Steals the Show. She has also co-written the award-winning picture books Two Bobbies: A True Story of Hurricane Katrina, Friendship, and Survival and Nubs: The True Story of a Mutt, a Marine, and a Miracle. She lives in Washington with her husband and Winston the Wonder Dog.